The best teams work in tandem, with different groups sharing ideas, that fuel innovation. When sales and marketing has a meeting of the minds with technical developers, much more is possible. And, when interface design becomes part of the initial planning process, it's easier to make sense of how a product is going to work. While many forget that once a product is launched, there's a very important phase beyond that: maintenance, improvement and customer support. We think it's as critical as any other aspect of product development, because failure to properly address issues quickly and correctly can hurt the success of your product. Being able to quickly communicate and cross-collaborate amongst ourselves, allows for the exchange of ideas across the many different aspects of product development. Because we understand and can see all the points in the development process, we often get a leaner development cycle and faster deployment. This is the reason behind the multidimensional service offering at Sixgreen Labs. • Design-centric software development. By mapping out your user interactions with the software and applying design initially, you can avoid wasting time developing features you don't need yet and you allow your product to be flexible, adapting to the market over time. • Data-driven software development. Short feedback cycles provide a more immediate perspective on what a customer needs you to deliver, in smaller more manageable chunks. • Integration of your marketing, community and support, so that once you've deployed, you can provide the best experience for your users. A good user experience will translate directly into greater ratings and and promote even more uptake. Your software company should be able to provide insights and services in all these realms. If they do, they can become your partner in success, allowing you to go forward with confidence. 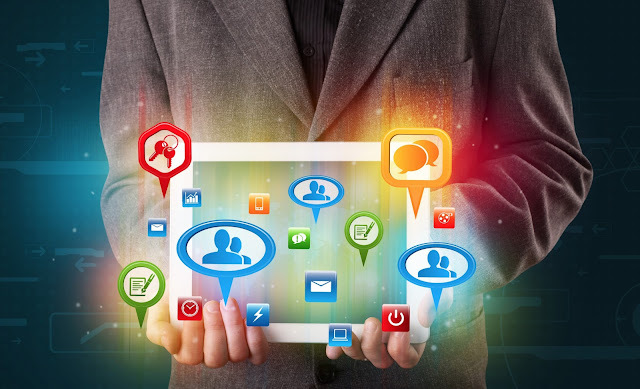 Is social media effective in generating buzz and promoting uptake of your new software product? But it's so much more than that. Social Listening (which is using social media to monitor the dialogue surrounding your company, its' products and its' competitors) also works during the product development cycle, providing you with some pretty sound strategies for learning about your market, determining key competitors, identifying influencers, and testing your assumptions. 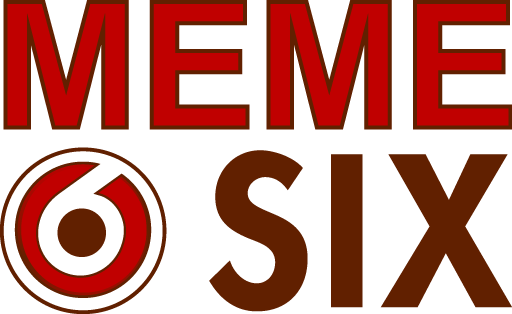 Because this is such an important part of product development, Sixgreen Labs has created Memesix, just to cover this aspect of business and product development. How Does Social Listening Fit in with Lean Product Development? Using Social Listening helps you to shorten your development cycle, producing products that users actually want, right away. By releasing early and making adjustments based on real-time feedback, you'll get from concept to completion quickly, with fewer do-overs. This is not a new idea, Google has been doing this for years using their invitation model for new products. Use Social Listening to Identify Market Gaps and Opportunities. Once you've identified and successfully developed one product, it might be time to move on to the next. The difference is - now you've got your finger on the pulse of a vast network of informed consumers who already have a positive relationship with your brand. Use this to your advantage, and seek out new opportunities by paying attention and engaging regularly. Those brand new opportunities may even be found in an existing product. You'll know because you're now paying attention to your consumers through Social Listening. Whether you acknowledge it or not, your customers could be talking about you in a public sphere at any time. The question is - do you know about it? Is there a complaint you could have handled? By showing your customers that you care enough to meet them on their chosen battlefield, and that you're brave enough to face their challenge publicly, you're telling the world you'll stand behind your product. That's a powerful message. Your consumers will speak up when they're unhappy with your product much more often than they will speak up when they're happy. Think about it. If its a great product, your consumers will simply use it, satisfied that it works and go on about their lives. The ones that come back to complain are usually unhappy, and it's on you to correct it. In the world of software, it's easy to be faceless. By establishing early and often that you're a customer-centred company you'll win the hearts and minds of your customers and those customers are the fuel for your next big thing. Why Should the Software Company Care? Ever heard of the saying “fail quickly”? It means that you mitigate your losses upon failure, and increase your chances of a pivot in the right direction by learning from your customer in a tight feedback loop. We reach out regularly for real feedback, in conjunction with working up key features, useability and benefits. Understanding what can go wrong can help us to react appropriately and it is is one way to ensure your success down the road. At Sixgreen Labs, our focus is on the entire vertical stack. 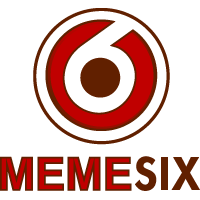 We have capabilities in the realms of marketing, design and UI, support, and programming, and our Social Listening is handled by the folks at Memesix. We are an 'all-in' solution, where we can harness the correct combination of talents for your product's success. After all, your success is ours, too. 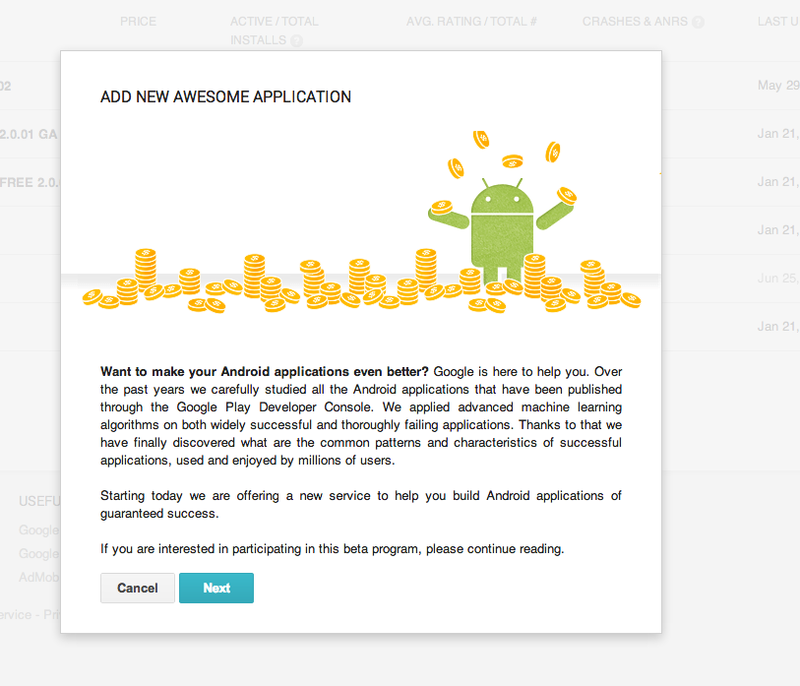 Google Play Developer Mojo is Awesome! 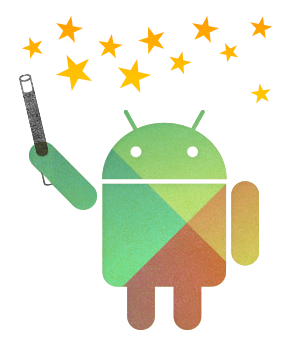 Well, it seems that even the Google Play developers wanted to get in on the April 1st action. Google has managed to bring us the most useful tool of the last decade and we android developers can now publish Awesome Applications with almost no effort! 1) First things first, you need to start the process manually. This is to help reduce resource consumption for the infinite Google code monkeys that will be working on your app. 2) Read the details and decide if you are still interested. You have to be sure here, because the next screen has some pretty important information that you need to answer correctly. I want my Android app to support iPhones and iPads (I also want it to support Microwave Ovens, but I can't select both. hopefully they will fix that in a later version). To help me sell, I'm going to want it featured on Wired. By default I want it installed for all humans on the planet and whatever alien cultures we find while I support the app (the analytic data for that market group are not all that solid yet, but I think it's a growing market). We also include some ASCII art as marketing material (because we all know its the only art form that hasn't gone away in all the years the net has been active). 4) All of this doesn't come easily. We now need to choose if we want "it all" or "it now". Unfortunately the system can only handle one at a time so we can't get "it all now". I suspect Google developers are working on that. Anyway, since we need to get this blog post rolling, I'll selet "I want it now!". Now we get realtime data on how many lines of code has been written and how much coffee has been consumed (all vital measures of how well a project is going, as all developers know). 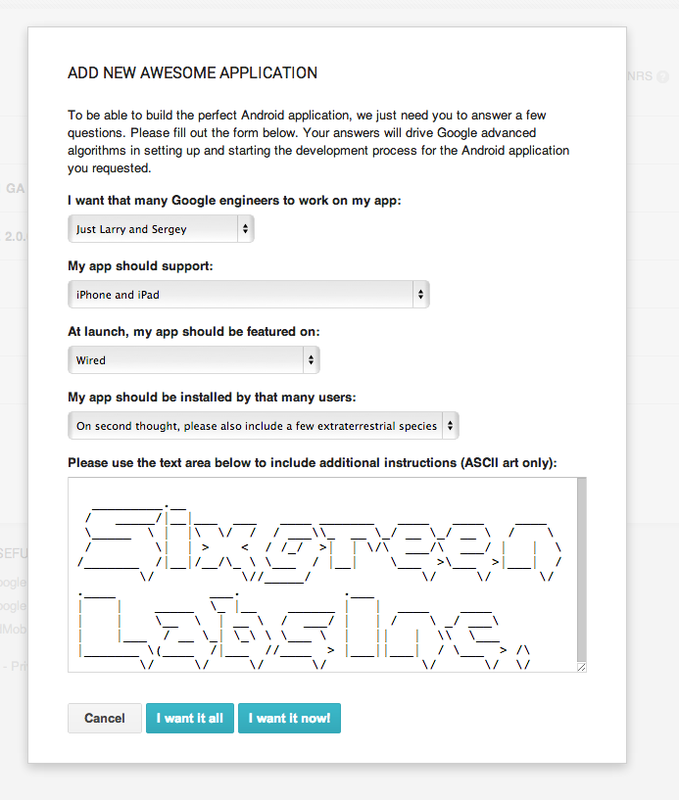 That my friends, are how Awesome Applications actually get built. 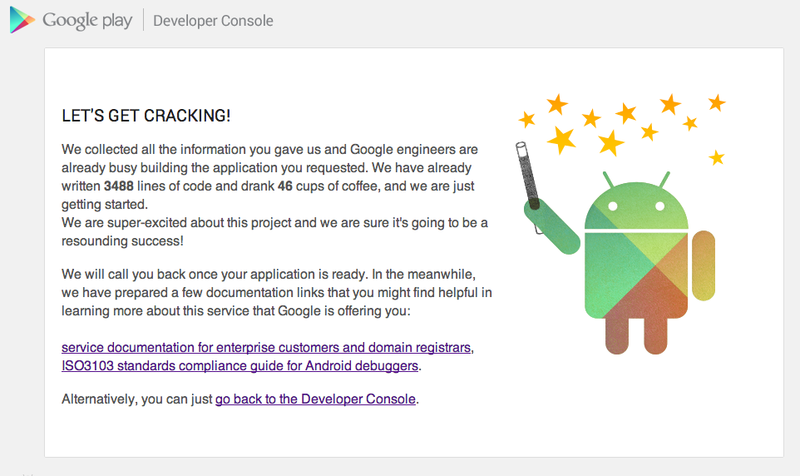 For more information on this awesome new feature that Google has given us developers, see this link.